“Us” is a more-intriguing-than-average horror thriller that hooks and holds us by slowly (sometimes too slowly) connecting disparate elements and pieces of information. It also leaves wanting more, which can be good, but only up to a certain point. Consider what we learn at the beginning: subtitles tell us there are thousands of miles of underground tunnels scattered throughout the United States, which currently serve no real purpose; in 1986, a little girl named Adelaide (Madison Curry), celebrating her birthday at the Santa Cruz Boardwalk with her two bickering parents (Yahya Abdul-Mateen II and Anna Diop), wanders off to the beach and enters a funhouse with the tagline, “Find Yourself,” and inside the hall of mirrors she sees a startling reflection; in a brightly lit classroom in an unknown location, blood-red credits appear against a close-up of a white rabbit as the camera slowly pulls back to reveal several more just like it, all while the film’s unsettling anthem plays on the soundtrack. How all of these components connect is the question that will keep us intellectually engaged in the film’s plot, which won’t become clear until the end, but even then, we’re left scratching our heads somewhat. 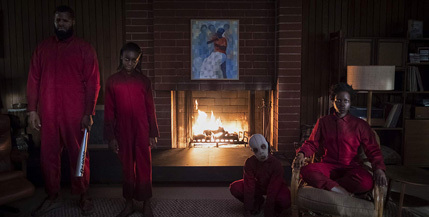 In the meantime, the story fast-forwards to the “present day,” when a now grown-up Adelaide Wilson (Lupita Nyong’o) has just arrived with her family – goofy but loving husband Gabe (Winston Duke); smartphone-addicted, teenage daughter Zora (Shahadi Wright Joseph); and Halloween-mask-wearing, pre-pubescent son, Jason (Evan Alex) – at their Santa Cruz beach house. The Wilsons’ situation seems happy enough, but as soon as Adelaide steps out of the car, she can’t help but think something is off. And indeed something is off, which Adelaide senses even more at the beach, where they meet up with their friends, the Tylers, a more affluent but evidently less happy family comprised of wife Kitty (Elizabeth Moss), husband Josh (Tim Heidecker) and twin teenage daughters Becca and Lindsey (Cali and Noelle Sheldon). Kitty asks Adelaide, “You good?”, but she’s clearly not, and she nearly has a heart attack when she sees Jason wander off to the same funhouse she did over 30 years ago. If that little incident wasn’t traumatic enough, later that night, four creepy individuals appear silhouetted in the Wilson’s driveway. When the family gets a closer look at them, they see they’re near-identical replicas of themselves, right down to their facial movements and body language. Before long, these mostly mute doppelgängers, each dressed in a red jump suit and wielding razor-sharp golden scissors, attacks their counterpart. Suddenly, what started out as a seemingly normal and harmless family vacation becomes an all-out battle for survival as the Wilsons (and apparently everybody else in the world) engage in a fight with…well, themselves, or some twisted, murderous version of them.